Congrats to Madeline Stesney and her Colorado Rapids Academy U 17 team for winning league and going a perfect 9-0 in the Colorado Youth Soccer league. 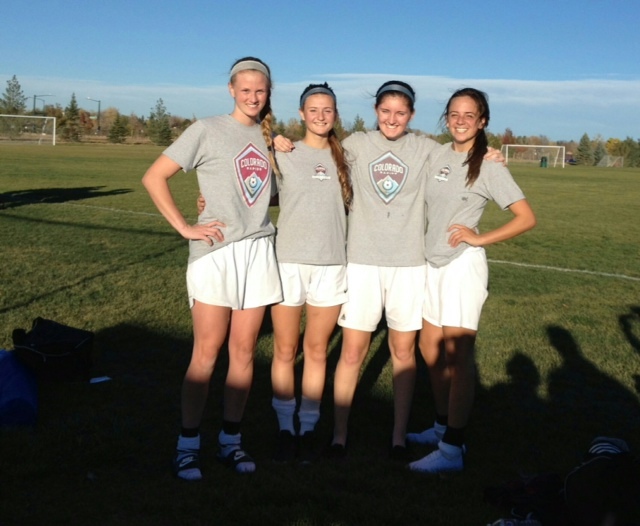 Maddie (second from the left) also plays for East HS and has been training with us for 3 years. – Congrats to Senior Katie Patrick and her Grandview Volleyball team for winning another title in the 5A CHSAA state championship. – Congrats to Sophomore Alex Osredker for helping her Regis Jesuit Volleyball team improve and qualify for state. – Please plan on joining us for our 4th Annual Thanksgiving morning “Burn the Fat before You Feast” Charity Bootcamp. Email us at Billy@billycorbettsretrofit.com or call 303 758 3138 to reserve your spot in this popular event.